Dog Overall Long II is perfect for dog breeds that are sensitive to cold temperatures and mud from the winter streets, and for dogs that are used to the cosy indoors – especially breeds with thin undercoats and senior dogs. Dog Overall Long II will keep your doggy warm and comfy in all weathers with the longer leg coverage. Breathable material with fleece lining provides cosy warmth and ensures ventilation. A light-weight, water resistant surface gives protection from rain and dirt. 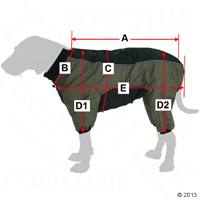 Dog Overall Long II is a loose cut with drawstrings, letting you fit the coat to your individual dog’s size. Cuffs at the legs ensure the overall does not slip and your dog’s whole body is protected against dampness and dirt. At last, an end to laborious bathing procedures after every walk! Dog Overall Long II is functional outdoor gear that will stand up to the muddiest, wettest conditions, for long, enjoyable walks in all weathers. (A) Measure back length from the lowest point on the base of the neck to the tail head. (B) Measure neck circumference at the lowest point on the base of the neck. (C) Measure chest circumference immediately behind your dog’s front legs. (D1/D2) Measure leg length straight down from the middle of the back to the paws. (E) Measure total length from the front chest to the end of your dog’s body. Size note: Our dog model in the diagram is a Hungarian Magyar Vizsla wearing a size 55. This entry was posted in Dogs, New Products by katieh. Bookmark the permalink.